31. Edward Alexander Benton (Ned) BLADES was born on 19 Apr 1850. A family story has been passed down about Ned's shooting skills. When attending quail shoots he would use two shotguns, a double-barrel and a single-barrel. Three quail were release and Ned would knock down two with the double-barrel and then still have time to pick up the single-barrel and get the third one. 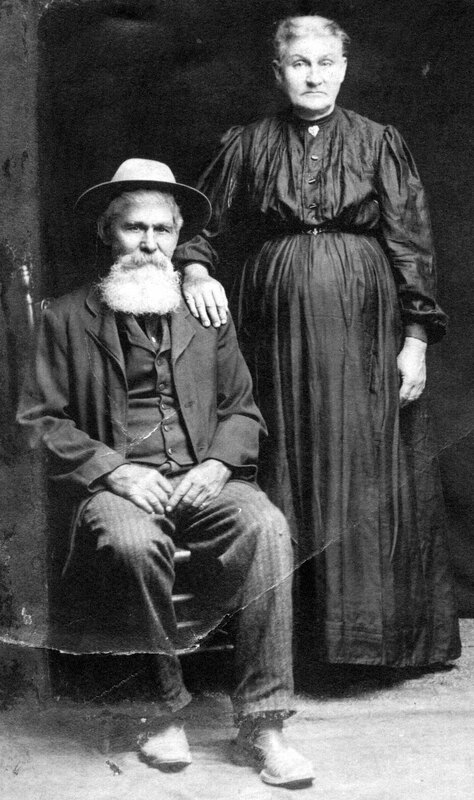 Edward Alexander Benton (Ned) BLADES and Susan Bethia (Suzy) LANEY were married on 3 Dec 1876 in Greene County, Missouri. Susan Bethia (Suzy) LANEY was born in Jun 1848 in Barry County, Missouri. She died on 1 Dec 1936 in Greene County, Missouri. She was buried in Rose Hill Cemetery, Billings, MO. ii. Nancy Ann BLADES42 was born on 4 Apr 1879. She died on 30 Apr 1958 in California. iii. Ransom Tillman BLADES42 was born on 22 Aug 1880 in Christian County, Missouri. He died on 20 Dec 1950.
iv. James Sigel BLADES42 was born on 13 Oct 1881 in Billings, Missouri. He died on 4 Feb 1962 in Twin Falls, Idaho. v. Jeremiah Mothar BLADES42 was born on 19 Dec 1882. He died in 1972.
vi. Birchie Ellen BLADES42 was born on 11 Apr 1884 in Billings, Missouri. She died on 9 Feb 1954.
vii. Norah Adeline BLADES was born on 5 Dec 1885. She died in 1963.
viii. Eliza Jane BLADES was born on 3 Mar 1888. She died on 20 Dec 1959.
ix. Andrew Benton BLADES42 was born on 24 Feb 1890. He died on 6 Oct 1954.
x. Isaac Leroy BLADES42 was born on 16 Mar 1894. He died in 1964 in Portland, Oregon. xi. Callie Catherine BLADES42 was born on 27 Sep 1895. She died on 15 Nov 1946.
xii. Bertha Alameda BLADES42 was born on 20 Sep 1900. She died on 30 Sep 1900. Edward Alexander Benton (Ned) BLADES and Unknown UNKNOWN were married on 23 Jan 1872.